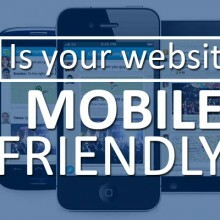 Is your website mobile-friendly. Google thinks it should be! Google announced that, from 21 April, 2015, it increased the impact of “mobile-friendliness” as a ranking signal in its mobile search results. As a result, websites that are not deemed to be “mobile-friendly” are likely to experience a drop in visibility from searches performed on mobile devices. Why is it important for my website to be Mobile-Friendly? websites make it easier for visitors to complete their objectives e.g. buying a product,reading a post, etc. How Can I Check if my website is Mobile-Friendly? You can undertake a quick test to see if a webpage has been deemed mobile-friendly by using Google’s mobile-friendly testing tool. Go to this page https://www.google.co.uk/webmasters/tools/mobile-friendly/, enter you website address and , you can then view the mobile usability report to identify if you website is mobile friendly or if there anyissues across your entire site. When you go to the mobile-friendly testing tool page you then enter a web page URL and then click on Analyze – see Figure 1 below. If your website passes the mobile-friendly test you should see a similar message as displayed in Figure 2 below. If your website fails the mobile-friendly test you have some work to do to ensure your website does not lose visibility in Google’s mobile search results. The mobile-friendly testing tool informs you where your website falls short of meeting its criteria and makes suggestions as to how you can make the page mobile-friendly. See Figure 3 below. Figure 3 – Not Mobile Friendly! If your website fails the mobile-friendly test, you need to think about how we can help you and redesign your website for you to meet the Google mobile-friendly analyzer criteria.